Heading to the beginning of spring season, ToXSL Technologies geared up to for the Holi celebrations as every year. Splashing each other with neon bright colors, water pichkaris & baloons, the flavor of gujiyas and sweets, fun and humor simply defines the way how all ToXSLians celebrate every festive day. 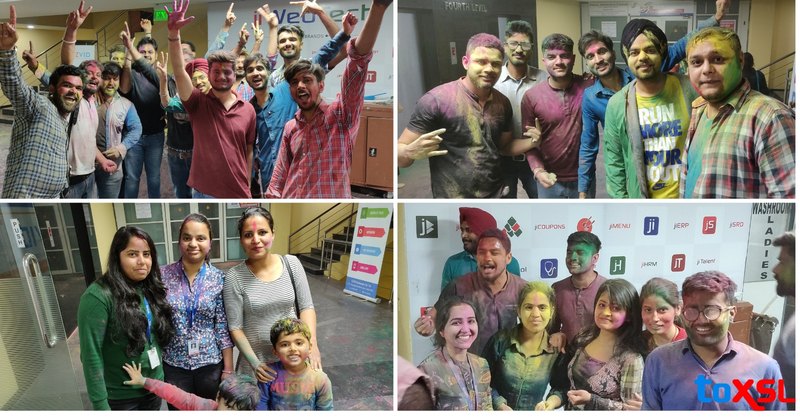 As on the occasion of holi, we had a holiday for the same, we decided to celebrate holi in office on 20 March evening itself. After winding up all our daily work, we all gathered outside the office area to put gulal on all our team members faces and enjoy the day. Spreading the feeling of oneness, love, and joy amongst every heart of ToXSL family. Colors of Holi, engulfing the air and the aura of gulal made the day more interesting for all of us. Having gujiyas and mouth-watering sweets added more flavors to our mouths. Cheers and hooting while putting beautiful colors on each other faces captured a lot of memories. We all headed and matched our steps on the music beats and enjoyed a lot while dancing on the loud music. Clicking selfies, making poses, capturing group photos, and spreading colored water all around made the festive mood. 'Balam Pichkari' forced every single person to move forward and enjoy the day to the fullest. On the whole, every one of us enjoyed a lot with the splash of colors on this festive day.